NAT stands for Network Address Translation. You can use NAT with configurations to your router to forward your internal static IP address to the far end. This option allows multiple public addresses to be designated to devices (PTZOptics Cameras) on the network. 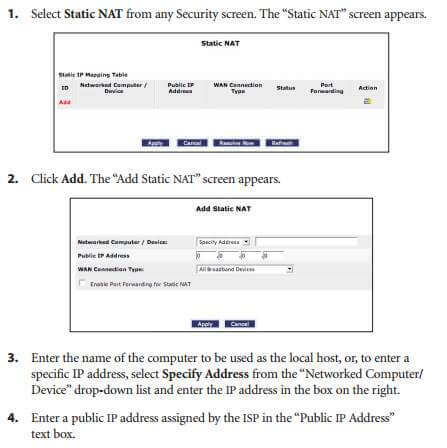 Static NAT allows devices behind a firewall and configured with private IP addresses appear to have public IP addresses on the Internet. This allows an internal host, such as a web server, to have an unregistered (private) IP address and still be reachable over the Internet. Every Router is different but you can see an example of a Verizon Router which can add Static NAT in 4 steps below. Router Configuration Tip: In its default state, the Router blocks all external users from connecting to or communicating with the network, making it safe from hackers who may try to intrude on the network and damage it. However, the network can be exposed to the Internet in certain limited and controlled ways to enable some applications to work from the local network (game, voice, and chat applications, for example) and to enable Internet access to servers in the network. 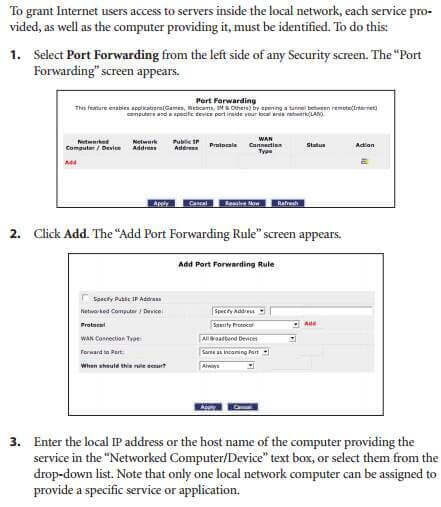 Port forwarding (sometimes referred to as local servers) supports both of these functions. 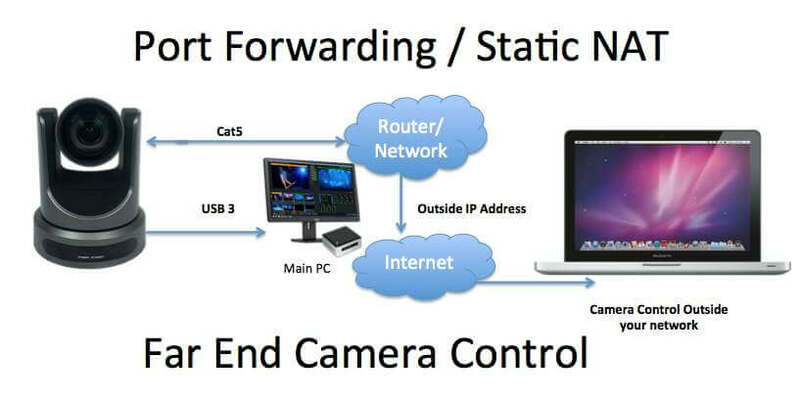 The UVC camera control software allows control of PTZOptics USB cameras using UVC protocols to control PTZ over just one USB cable! This is ideal for small conference rooms or multiple camera set ups where you only want to run a single USB cable to each camera. Inside the software there is the ability to host a external IP address. With a little configuration to your router you can open this IP address to the outside. The VISCA software works the same way. The only difference is how you connect to your PTZOptics cameras. With the VISCA software you have to connect your final RS-232 cable to your computer using a RS-232 to USB adapter. Best for easy set up. This software uses a single USB cable and provides advanced camera presets, preset visualizer, controls multiple cameras and much more. Best for longest cable runs. You can use RS-232 cabling for distances greater than 1,000 feet. The VISCA version of our UVC Control Software has all the same features but instead of using a USB 3.0 connection we only require RS-232 and a USB 2.0 adapter. 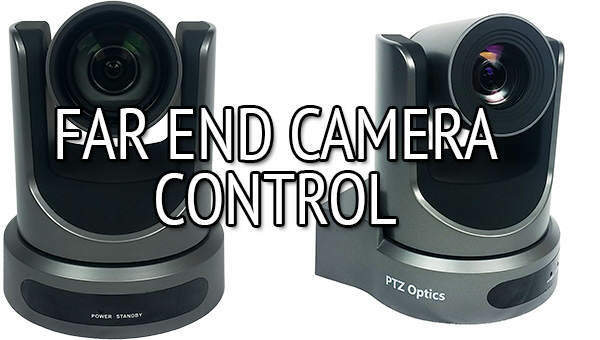 VSee is currently capable of PTZ camera control with the PTZOptics USB camera models. This is ideal for tele-medicine applications and simplify’s camera controls for doctors. Because VSee has built the camera controls directly into the VSee client “far end” users with PTZOptics cameras can control the PTZ operation of the camera using just one USB connection to “far end computer”. VSee is using absolute UVC 1.0 protocols which could be used in the future to also build in camera presets.